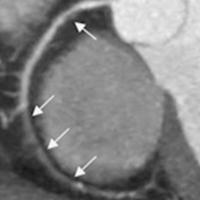 CHICAGO - An analysis of data from an international study of coronary CT angiography (CCTA) shows that men and women with mild coronary artery disease and similar cardiovascular risk profiles share similar prognoses, according to a study presented December 3 at RSNA 2013. Dr. Jonathon Leipsic of St. Paul's Hospital in Vancouver, British Columbia, and colleagues used data from the Coronary CT Angiography Evaluation for Clinical Outcomes: An International Multicenter (CONFIRM) Registry, which collected information on 27,725 individuals in six countries who underwent CCTA. From the registry, Leipsic's group identified 18,158 patients without known coronary artery disease whose CCTA results were normal or indicated nonobstructive disease, in which coronary arteries were less than 50% blocked. These patients, including 8,808 women and 9,350 men, were then matched on the basis of pre-existing cardiovascular risk factors and the extent of their coronary artery disease as determined by CCTA, resulting in a one-to-one cohort of 11,462 patients. Analysis of the matched cohort showed that, controlling for all cardiovascular risk factors, nonobstructive coronary artery disease suggested a similar adverse risk of death or heart attack in both men and women. 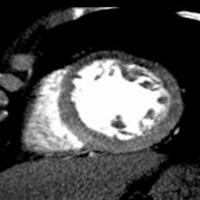 Conversely, the absence of plaque on CCTA suggested a good prognosis for both men and women. Of the patients in the cohort, only 251 experienced a heart attack or cardiac-related death during an average follow-up period of 2.3 years, according to Leipsic's team.